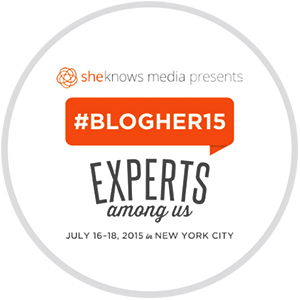 Anybody attending this week’s #BlogHer15: Experts Among Us Conference in New York City may see something awfully familiar on the exhibition floor! We were selected by GoDaddy to be a featured Woman-Owned Business and an awesome assortment of Life with Tigers goodies including catnip toys and greeting cards will be featured in the GoDaddy Booth #1215! We (my feline staff and I) are so pleased and proud to be included in the event. Work hard, play fair, and sometimes, good things happen!!! A few weeks ago, I went as part of the Ink & Sword team to be vendors at CatCon on Los Angeles. We sold our beloved Pet Care PSA Art Prints plus a large selection of Severed Things Catnip Toys and Handmade Cat Dolls to oodles of great folks! The event featured Simon Tofield of Simon’s Cat, Ben Huh of Cheeezburger, Lil Bub, Will Braden, the Creator of Henri, Le Chat Noir and many others. We missed 2 flights on the way to the West Coast, due to a few terrible traffic jams, then got into 3 more terrible traffic jams while in Los Angeles. Upon my return to New York City the following day, I got stuck in 2 more terrible traffic jams on my way home from the airport. 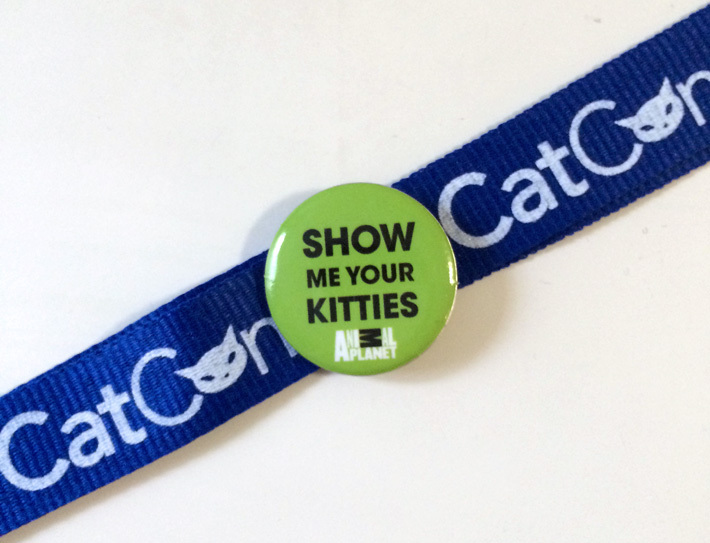 So while CatConLA was a great time filled with fine people, lots of laughs and plenty of cat tattoos, I seem to remember the view of tail lights the most. Go figure! 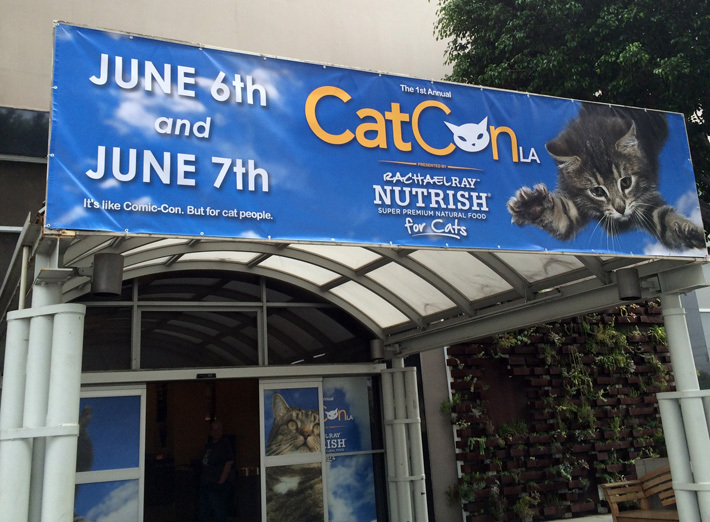 But the best news of all was that CatConLA donated $33,350 to FixNation and Lil Bub’s Big Fund! These organizations are doing great things to help special needs pets and working to reduce the population of homeless cats. Bust Magazine, Craftacular and Maker Faire ahoy! 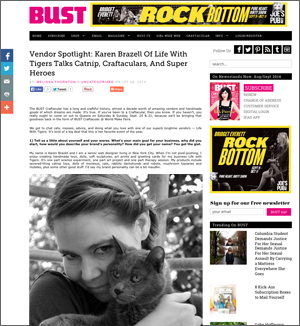 Hooray for Bust Magazine! 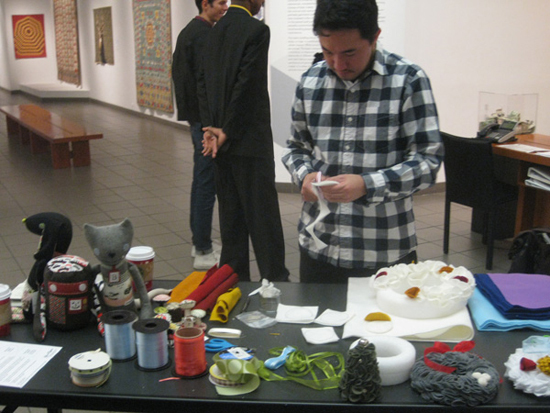 Not only do they throw a mean craft faire, but they were lovely enough to post a feature about me on their website today! 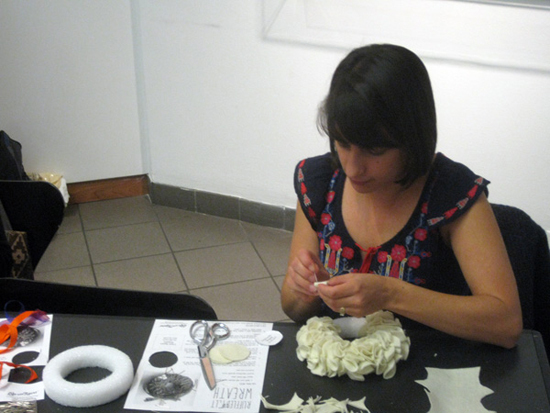 I talked to Melissa Thornton about crafting, how I create, how I got started and the inspirations around me. 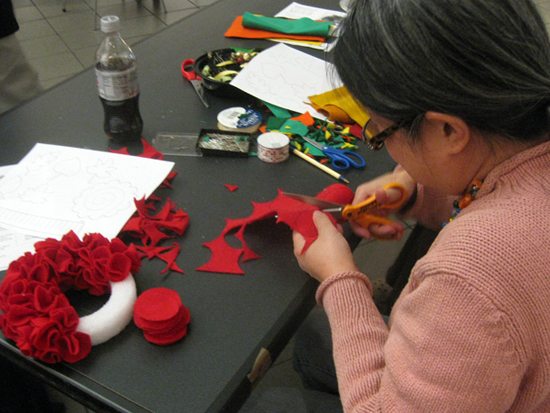 It also reminds me that there are only 10 days to go until the Craftacular at the World Maker Faire! If you’ve read the article, swing by my tent and make me blush by telling me so. Oh, and just so you know, if you look for me based on that photo, don’t be surprised when you see that I’ve cut off over 18 inches of hair since that photo was taken. Short hair, forever!!!! I’ve thrown away my hairbrush. It was liberating. It’s Time to Fire Up The Flaming Unicorn Again! 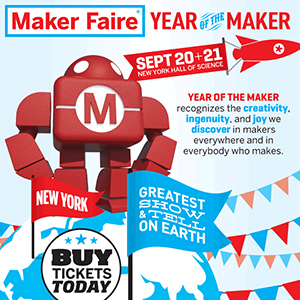 It’s only 25 more days until one of my favorite events of the year, the World Maker Faire! I sometimes tell people that it’s the best place in New York to learn how to pick a lock, make your own PVC spitball guns or enjoy a full-size human mousetrap. Mentos and Diet Coke fountains? Check! Body paint? Oh yes. Build a drone, catch a panel discussion, learn to solder or chochet! Roger That! You could also stop by the Bust Craftacular area and visit us at the Ink & Sword booth, where we will be enjoying the festivities while offering up our super awesome Stellar Science art prints, plush robots, Severed Things Catnip Toys and our brand new Super Hero animal plushies! If all else fails, you will at least come away from the event with fun memories, some great photos and you will finally know what the heck Arduino is! 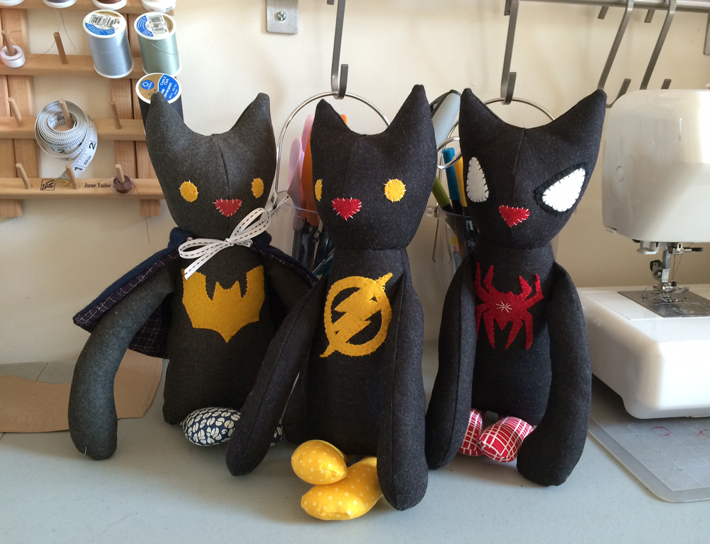 Here is a sneak peak at some work in progress…Super Hero Cat Dolls! These three are the Batman Cat, the Flash Cat and the Spider-Man Cat. They still need their cowls. I would like to create a Hulk Cat as well, and look forward to finding some awesome green fabric! 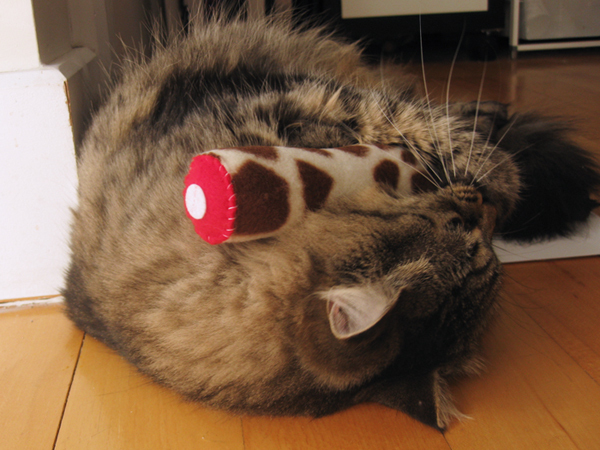 There are also a few brand new Severed Things Catnip Toy styles on the way. When Life with Tigers began many years ago, the phrase “Handmade in Brooklyn” was always present on our packaging, from the hangtags on the dolls to the inserts on the cards, all the way to the instructions on the Severed Leg Catnip Toys on how to clean the tiger slobber off the fabric after enthusiastic tiger attention. Always there, it was a declaration. Handmade = awesome. 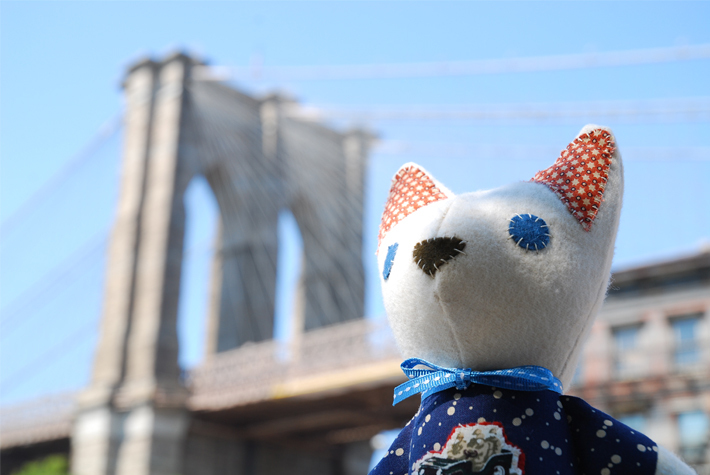 Brooklyn = mega awesome. Put them together, and you got something special. But times are changing, and so must we, and our biggest change has just happened! Life with Tigers has island-hopped. After 15 years in Brooklyn, we have set up shop in Manhattan. Moving between the boroughs of New York City is like moving to another country. It’s not technically far, but it’s REALLY far away if you ask my Brooklyn friends. They understand, of course, but a 40 minute ride on the G train to get 3 miles seems closer than a 28 minute ride on the express train to get 13 miles when it means that no body of water has been crossed. But they also agree about how expensive Brooklyn has become in the past few years. So the LwT feline staff has picked up their kitty caves, squishy pillows and food bowls and happily migrated to new digs. Thankfully, they like it very much! Since we are talking about change, if you are reading this, then you noticed that the new website is up! We’d been wanting to upgrade for a while, but it took some serious issues with our web host to inspire the change. Goodbye forever, old server. Please pardon our dust as we relink wayward photos and fix wierdness for the next week or so. 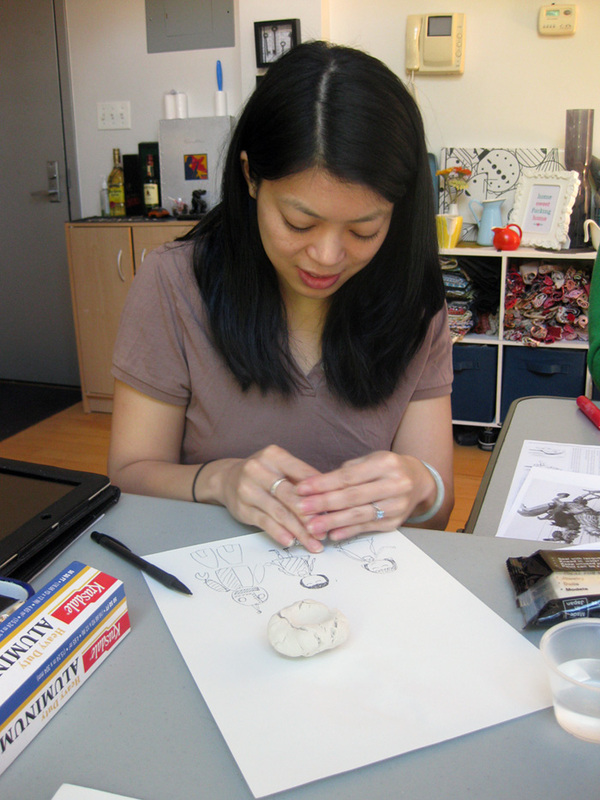 I had a guest over last weekend for some pre-holiday ornament crafting. We didn’t have much time, so we crammed a few projects into one short afternoon, with varying degrees of success…I don’t know if we will be trying the pipe-cleaner snowflake again! 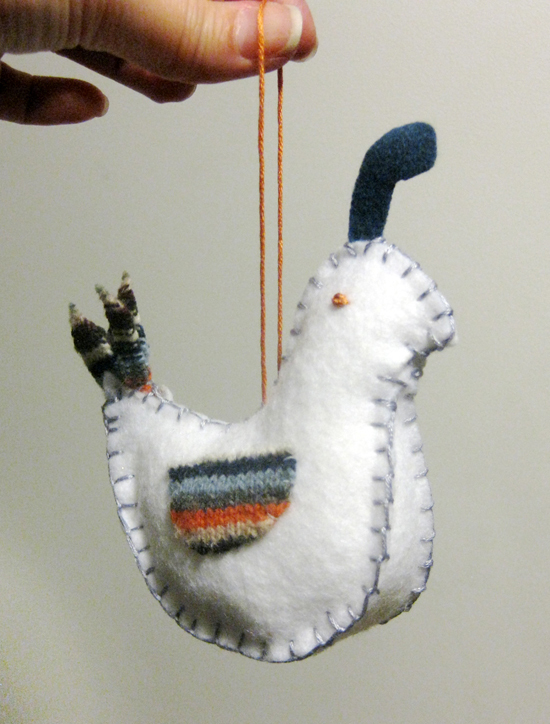 I decided to create a Felt Partridge ornament this time. I did not follow the pattern completely, as I wanted to avoid using the sewing machine as the instructions call for. A simple blanket stitch around the outside was good enough for me! There was also supposed to be some needle felting involved for the wings, but I poo-poo’d that instruction as well and used pieces from an old scarf. In the end, it came out quite cute! 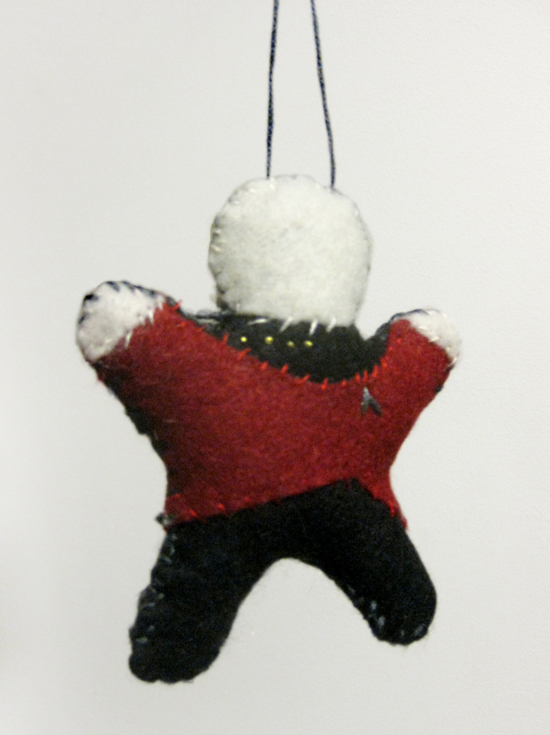 Bre, my crafting accomplice, went with an ambitious plan to create a Jean-Luc Picard ornament! Originally supposed to be a gift, I think it ended up on her own tree. Looks like somebody will be receiving a gift card instead! Make It So! Or, in this case, Make It Sew!!! All it needs now is a little Riker and Worf! And in the end, we had Felt Picard riding Felt Partridge horsey-style, because of course we did. Happy Holidays! 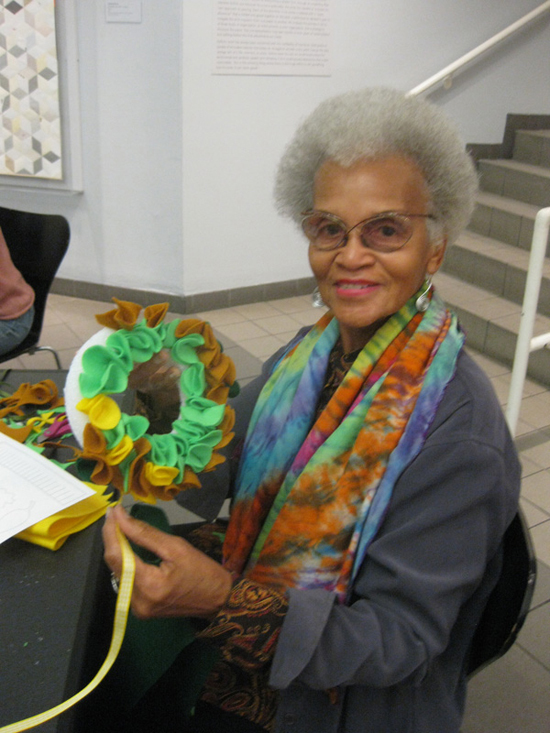 Last Thursday, I lead a Make-It Thursday workshop at the American Folk Art Museum. 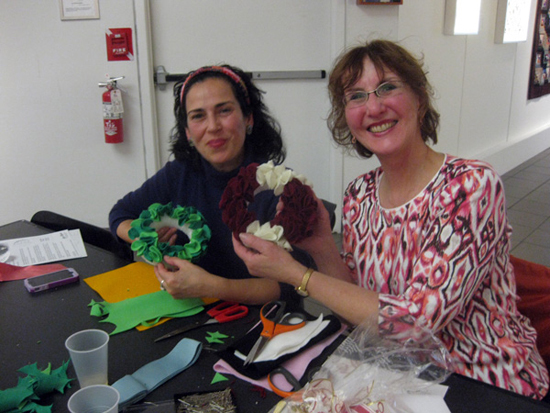 We gathered for wine, creativity and conversation as we made the Ruffled Felt Wreaths that I love making for friends this time of year. Here are some photos of the wonderful evening. 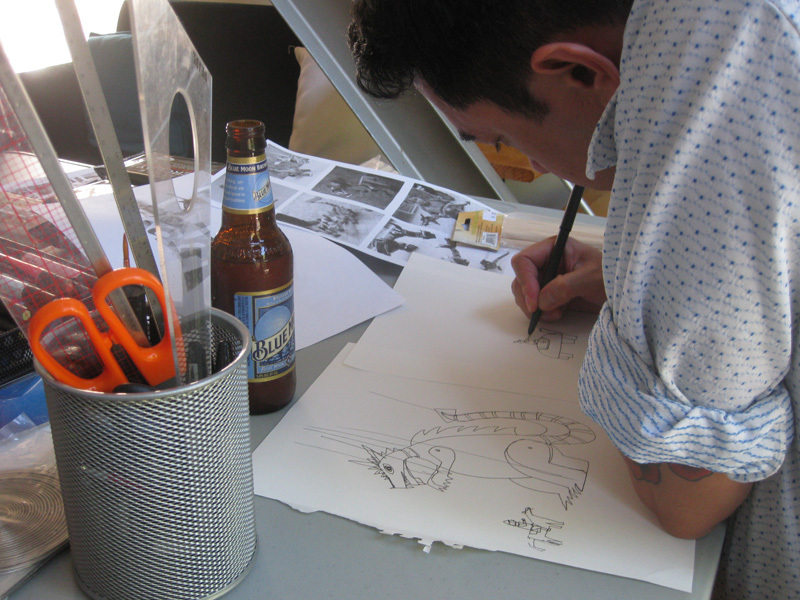 My assistant for the workshop, Jed from Ink & Sword, was showing the ladies how it’s done! By the end of the evening, his wreath was a crowd favorite. 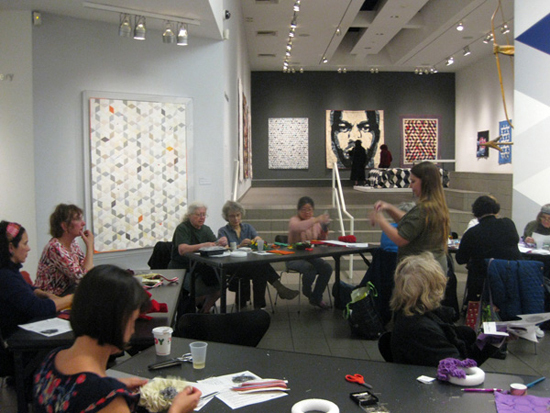 We set up shop right there in the gallery, close to the beautiful Alt_Quilts exhibit. Everyone chose different color schemes. This red one is stunning! The main table, where we showed off some samples of circle and square felt wreaths, plus Jed's universally loved wreath in progress in the upper left. 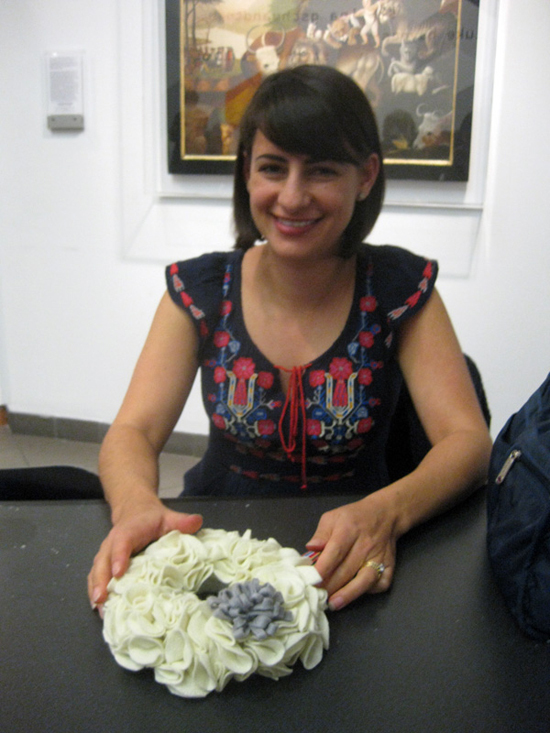 This lovely wreath looks very much like her scarf! Personalities really came through. 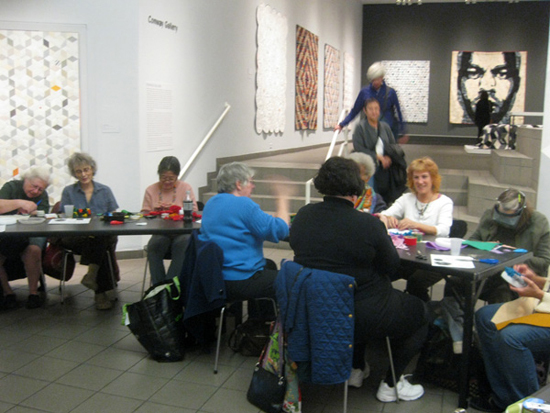 I am really grateful for being invited to host this workshop at the museum. Everybody had a wonderful time! 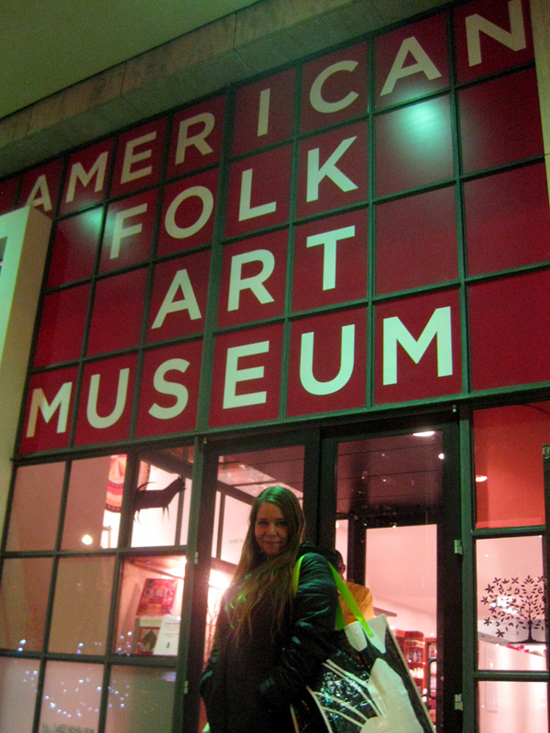 Thank you to Rachel and The American Folk Art Museum. Please visit them at 2 Lincoln Square in New York City. 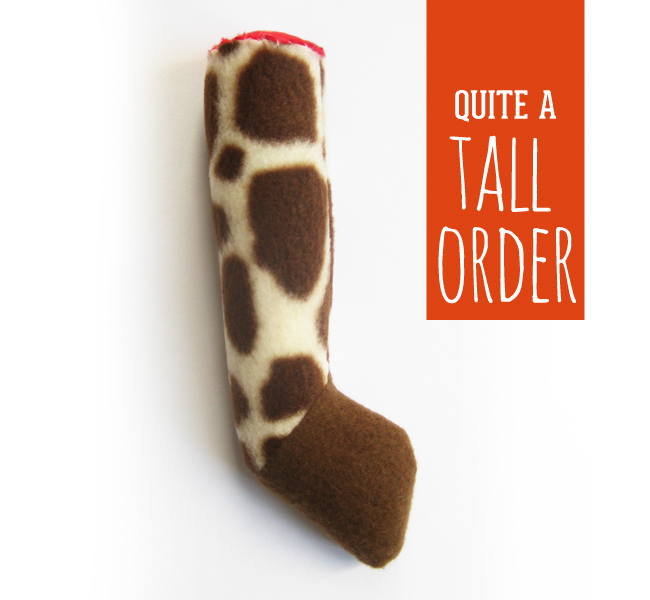 A new severed leg toy has arrived in the shops today, and this one is quite a tall order…tasty giraffe legs for your little lion! I have been wanting to make giraffe legs for quite a while, and I am very pleased with these extra-long tasty tiger treats. Super cute at 6 1/2 inches tall, they are our longest toys yet. Pair one up with a zebra leg and transport your tiny hunter to the plains of Africa. Intern Moo has tested them and given them 2 paws up! Not only are these darlings NOW on sale in our etsy shop, but they are also available in our new Reddit Marketplace shop. 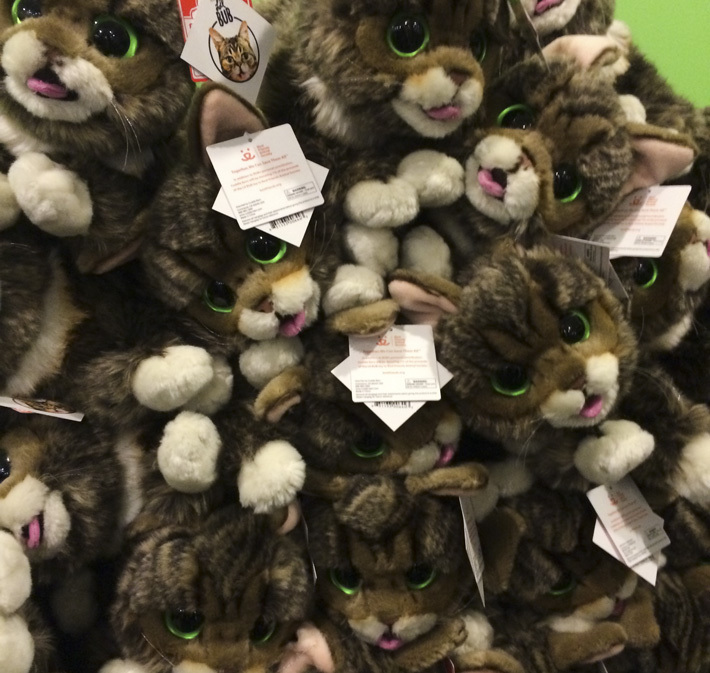 The holidays are coming…start thinking about putting legs in your kitty’s stocking! 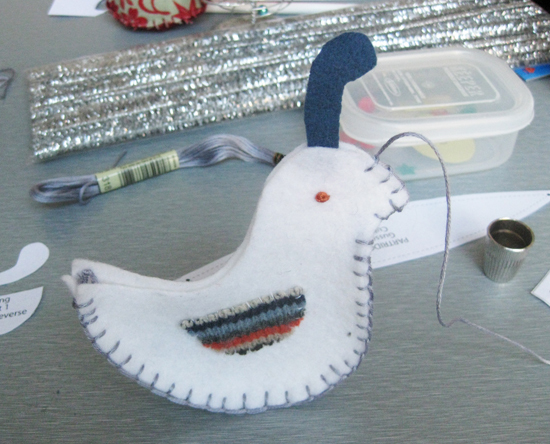 Crafternoon Number Two: Autumn Craft Smackdown! 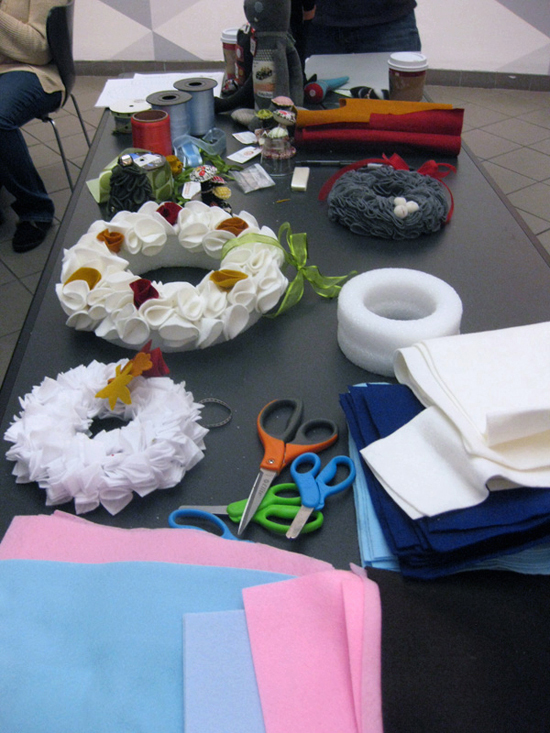 With memories of last year’s mega successful Christmas Craft Smackdown! floating through my head, I rearranged the tables again this past weekend and invited some folks over for Crafternoon Number Two: The Autumn Craft Smackdown. 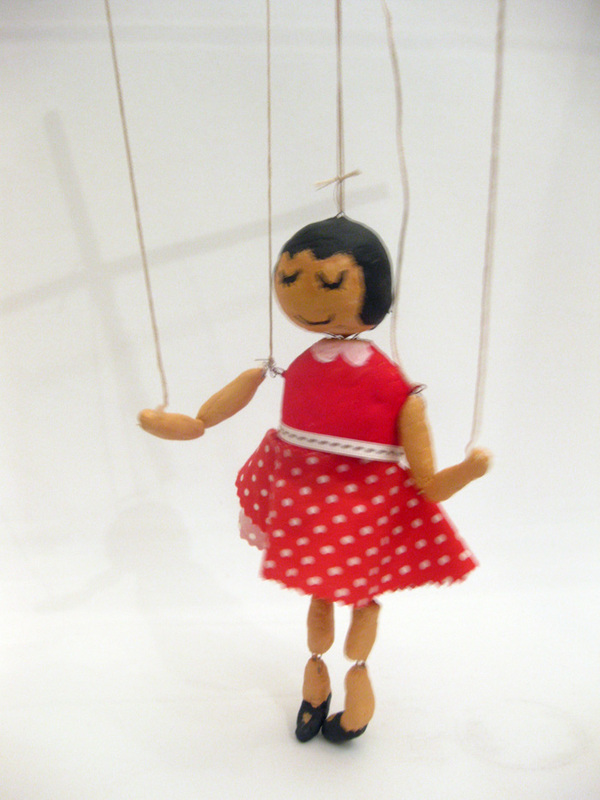 This time around, the theme was “Puppets and Marionettes”. 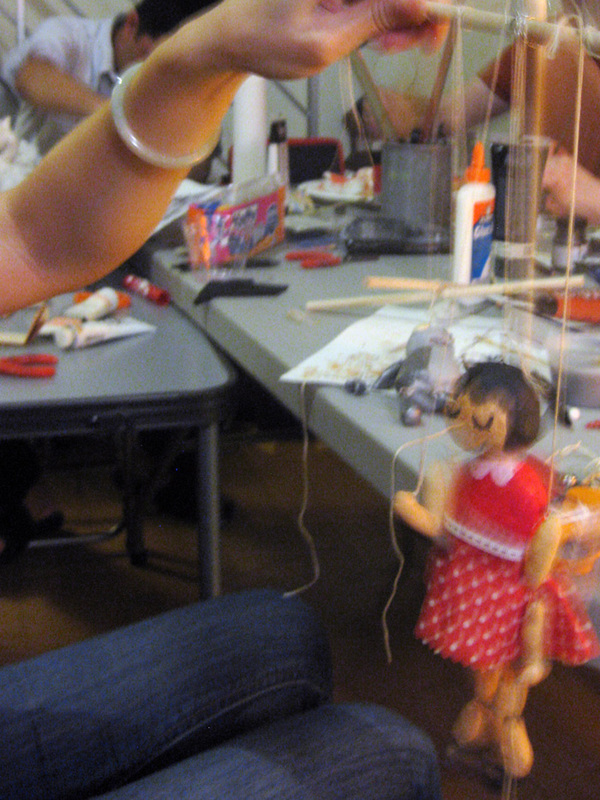 Some of us really enjoy puppet theatre and always wanted to give puppet making a try. 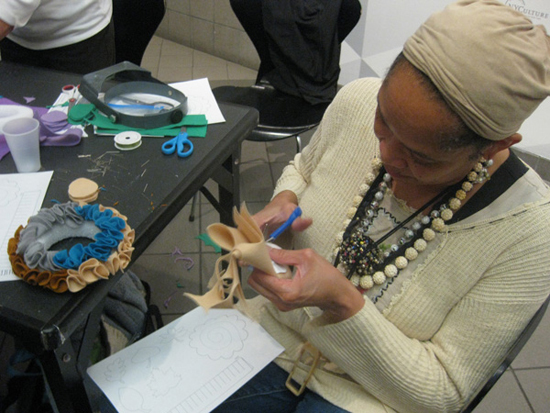 While signing up for the Puppet Lab at St. Ann’s Warehouse is not in the cards for most of us, an afternoon of puppet making most definintely was! Armed with some basic ingredients and an “I’ve never done this before but we are gonna wing it and see what happens” attitude, we were off. 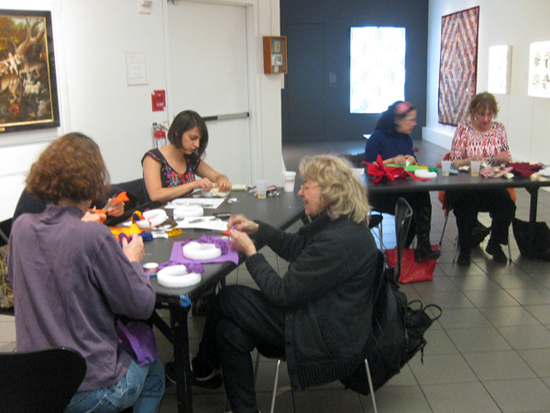 Just like last year, this session turned into a 12 1/2 hour Craft-a-thon fueled by spirits, a taco bar, creativity, great music and laughs. Here’s a round up of how it all went down! 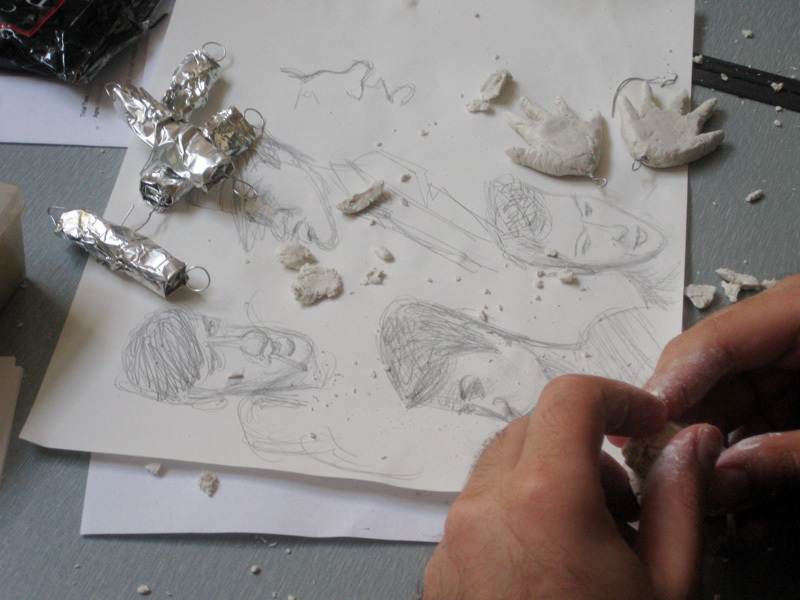 All of our marionettes began as sketches. Some more detailed than others, but all very helpful to keep us focused. 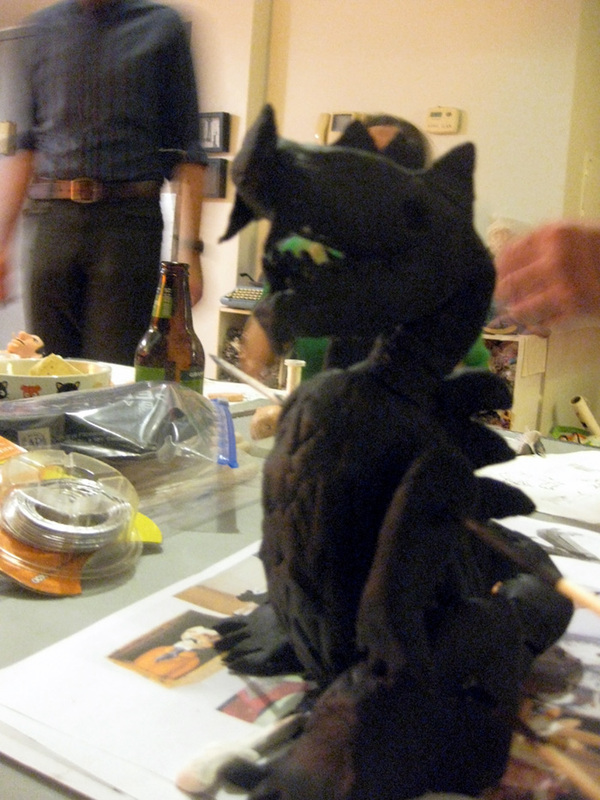 Jed sketched out an ambitious mighty dragon marionette! 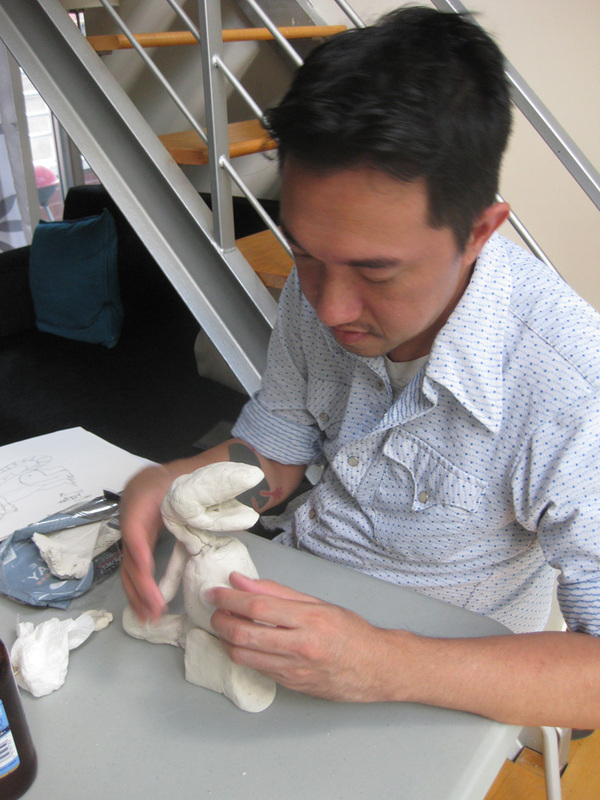 Brianna began sculpting her two marionette designs out of paper clay. Brianna was a crafting machine once more! 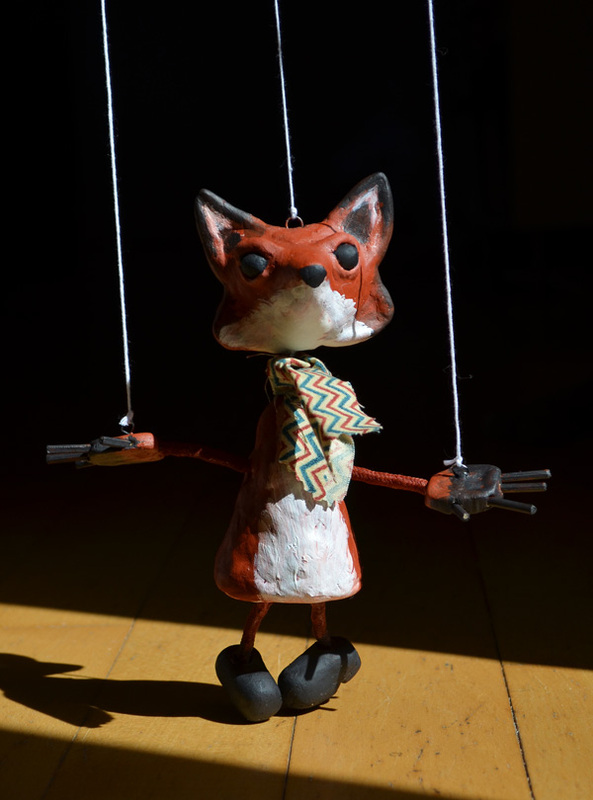 I wanted to make a ‘not so fantastic’ Mr. Fox marionette, and it started out looking like a chihuahua. The dragon starts to take shape! It was super cute, even without its ferocious teeth. 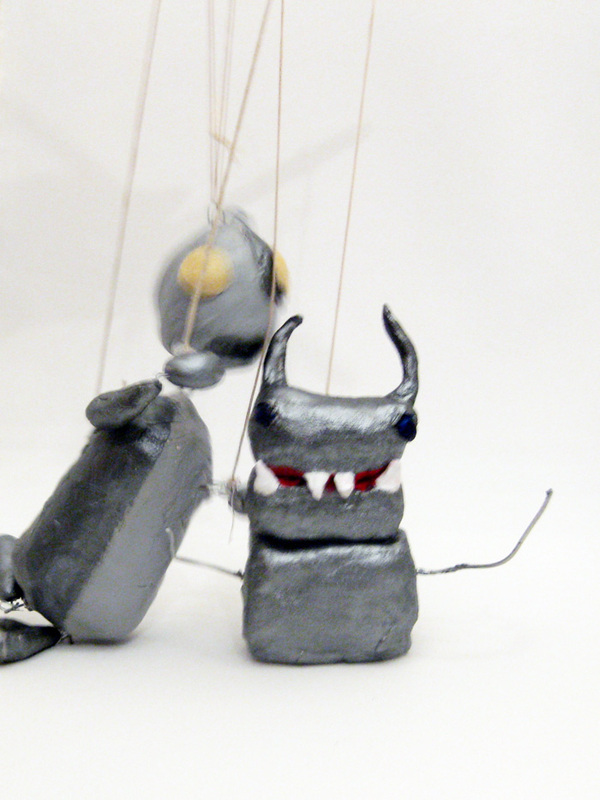 Soon, puppet parts were forming, wire was getting twisted, and paint started slinging. It also looked a bit like a puppet shop of horrors with all the body parts layout around. This is at about the 7-8 hour mark…such a dedicated group of creators! The mighty dragon got his undercoat of paint long after the sun had set! Our creations were all shapes and sizes. 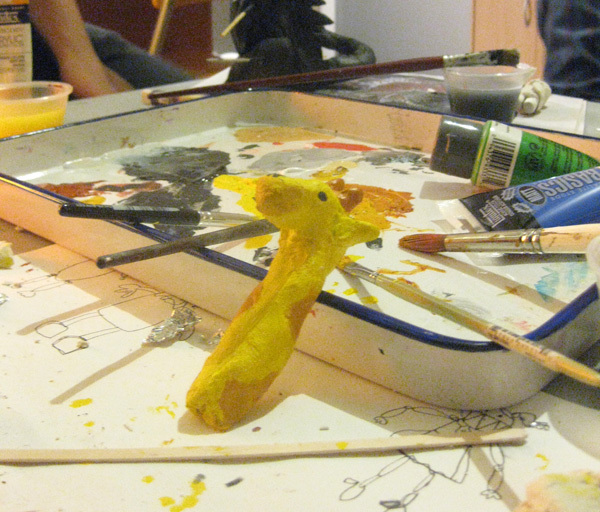 This was Gordon’s freshly painted giraffe's head waiting for it's body! 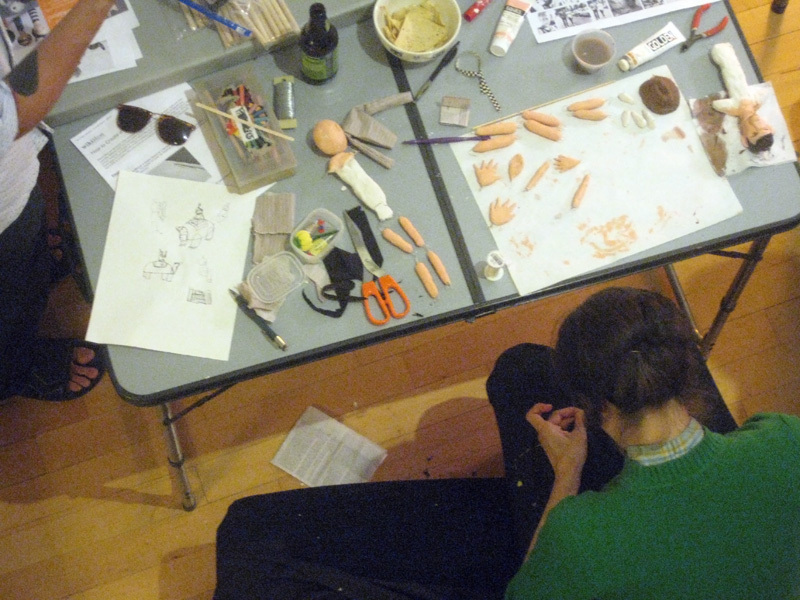 I love this photo, as Rachel’s puppet parts look like little severed lady fingers! Perfect for the studio that makes severed thing cat toys! Brianna was the first to string her creations and we all waited jealously to see her first dance! And voila! Here is one lovely lady, built entirely by hand by Brianna. She had awesome dance moves thanks to some clever wire work in her legs! 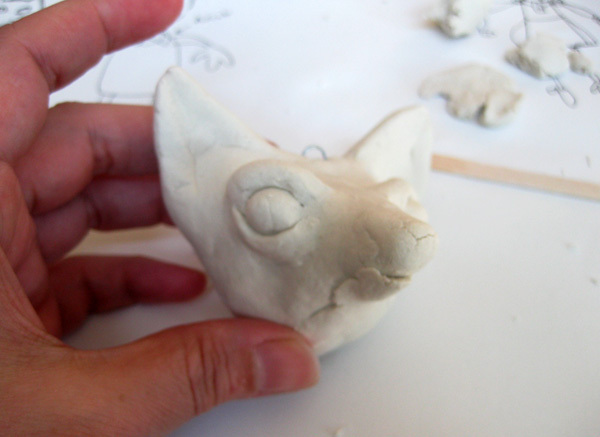 A seal head for a yet-to-be-finished seal body. 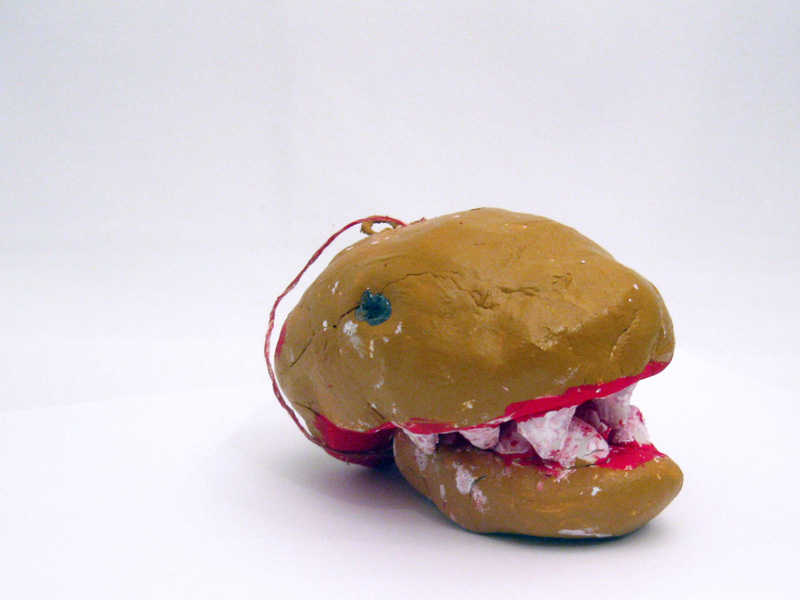 Paul said something about fashioning it’s body from found objects, perhaps even my vacuum cleaner. A wobbly robot who punches himself and a mechanical space robot bug from another planet, as produced by Brianna and Laura! 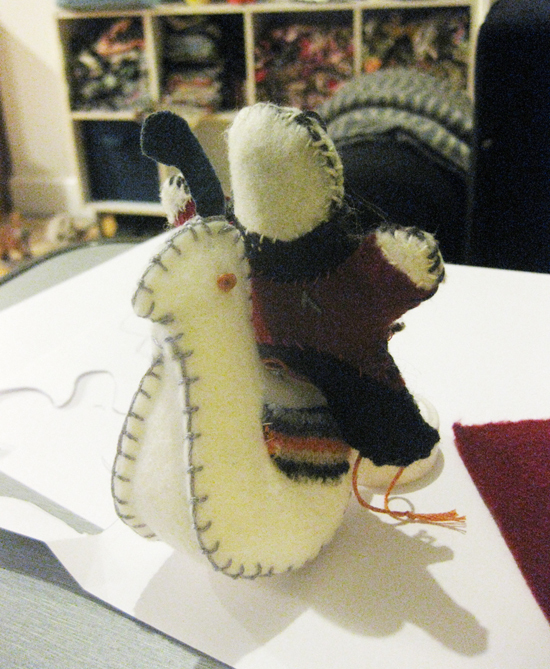 My finished fox puppet, complete with ascot, ready for his solo! As is usually the case, I cannot show you all the finished and unfinished items, as they are works in progress and will be making their public debuts elsewhere. What I can say, without a doubt, is that we have some creative friends, and I cannot wait until all our puppets get together for a dance off! 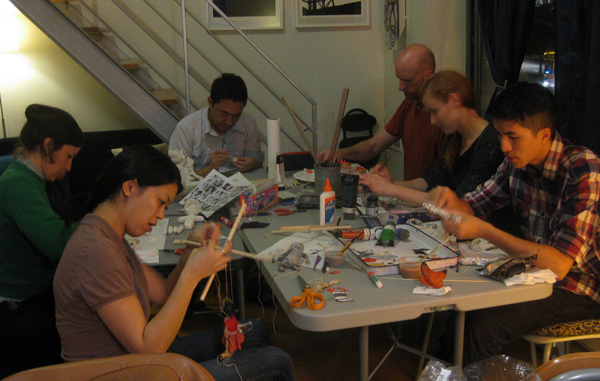 Thanks to Jed, Brianna, Gabriel, Rachel, Laura, Paul, Kate and Gordon for making our our little puppet lab such a huge success!